As I was reading 1 Corinthians 6, I remembered this photo that I took several years ago while standing amid the ruins of the city of Corinth. High above the city is the acropolis (literally “high city”). It was the location of the temple to Aphrodite, the goddess of love, with its one thousand prostitutes. 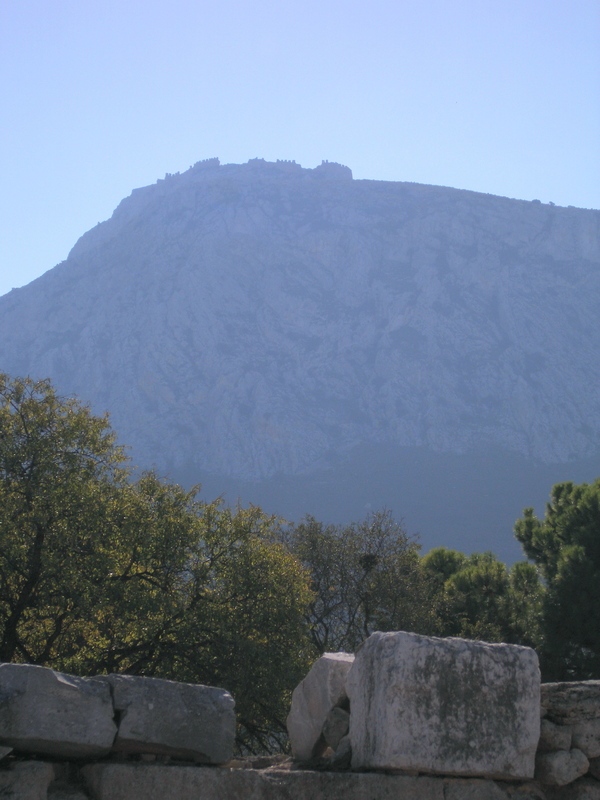 Corinth was a cosmopolitan city with a thriving sea port and travelers from throughout the Mediterranean world. Some have called it the “sin city” of its time. In stark contrast was the Christian life. Christians did not have a prominent temple that stood high above the city. Christians had something greater than that – their bodies. What is the body for? The worshippers of Aphrodite provided one example. Christians would provide another. Christians belong to Jesus and are part of his body. This is a union of the Holy Spirit. Paul writes, Do you not know that your bodies are temples of the Holy Spirit… The point of the temple was that God lived there. Part of the point of being a Christian is that God lives in you (that’s the Holy Spirit). If you are a Christian, it isn’t only when you pray. The Holy Spirit has taken up permanent residence. You cannot stop being someone who has been bought with a high price (Jesus paid that price on the cross). So, honor God with your bodies. In other words, discover how to live in such a way that in everything we honor God. Like so much of life, I’m in training. This is a life-long process of becoming the temple that God wants me to be.